Looking for a new Winter, Christmas or New Year destination? Murmansk is a quite young city (founded in 1917), but has a rich historical past. During our Murmansk city tour you become acquainted with history, the flora and fauna of Murmansk region, the function of Murmansk city in the past, nowadays and in the future. With a minibus we can visit memorial "Alyosa", the old part of the city, the first stone building, the Historical museum and the Naval Museum with several expositions about history of the Northern Navy with photographs, uniforms, items and precisely build models of ships and submarines. We will visit the harbour. 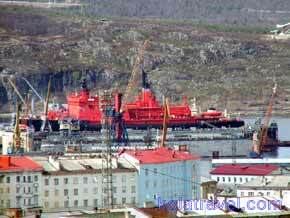 Probably you can see one of the many Atomic icebreakers, because among the worlds cities, only Murmansk can boast a fleet of powerful Atomic icebreakers for use on the Arctic seas. 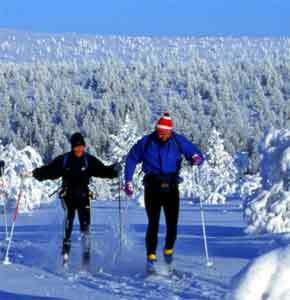 Winter is a fascinating time of the year on the Kola Peninsula. During December and January the forest, mountains and tundra are shrouded in darkness, with only the occasional ghostly illumination of Northern Lights, stars and moon reflecting off the white snow. And by March the sunlight can be dazzling in its brightness. Taste the Russian winter in a nice environment full of Snow Fun. This is an excellent time to come for a skiing and snowmobile adventure, to skim over frozen lakes and along river corridors in fir forest - and to spend a few nights in the Russian wilderness. Snow Fun you will get during several typical Northern winter activities like; ice fishing, snowshoe hiking, cross-country skiing, alpine-skiing, snowmobiling and excursions to interesting places like Saami village Lovozero, the mountain cities Apatity and Kirovsk and to Worlds biggest city beyond the Polar Circle Murmansk. The amount of Snow Fun is only depending on how much free time you can spend here in the North. Your accommodation is in good and nice hotels of the North and/or in a comfortable lodge in the wilderness with sauna depending on the program you choose. From middle of December to middle of May. For request of dates: >> info@kolatravel.com! End of December / beginning of January. For request of dates: >> info@kolatravel.com!